★청주88대리운전은 대리운전 이용시 1,000원을 적립해주는 대리운전어플입니다. 어플을 통해 간단한 조작으로 대리운전을 이용하고 적립금을 적립하여 언제든지 현금으로 이체할 수 있습니다. 집전화번호등 유선전화번호,혹은 070과 같은 인터넷번호도 등록이 가능하여 어플을 통하지 않고 청주88대리운전 043-222-8888 를 등록된 전화번호를 이용해도 적립금을 받으실 수 있습니다. ★청주88대리운전은 신규회원가입 이벤트로 회원가입시 1,000점의 적립해드리고 있습니다. ★ sake Person 88substitute driver is 1,000 won to earn that deputy deputy drivingdriving applications. Driving through the simple operation of applications using a proxyat any time to earn cash reserves can be transferred. Such as home telephone number, landline phone number, or 070numbers can be registered as the Internet without going through theApp Cheongju 88 043 -222-8888 substitute driver using theregistered phone number you can get even reserve. 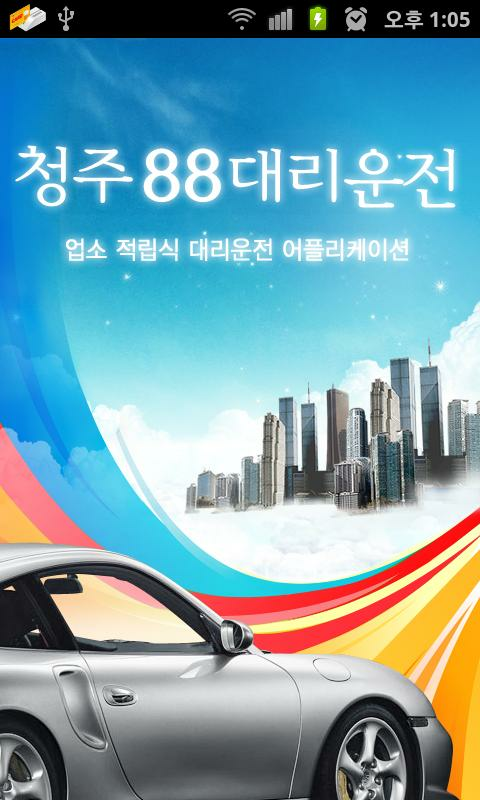 ★ deputy driving the sake of 88 new members join the event toearn 1,000 points when you register at no cost. * 아산고총동문회 어플은 동문들의 업체를 한 눈에 보실수 있는 어플입니다. * 각 카테고리마다 동문들의 업체를 확인하실수 있으니 어플 활성화를 위해 동문들의 많은 관심을 부탁드립니다* 어플 광고 문의는 아산고총동문회 사무실 조경희 간사님 (010-4220-5069) 에게 문의부탁드립니다.----개발자 연락처 :02-6224-3125서울시 성북구 장위2동 성북벤쳐센터 B105It is here that you cansee at a glance the app * ahsango alumni Alumni Association app. * Each category can check the company of so many interestedalumni Alumni Please enable applications toPlease contact the Alumni Association office ahsango jogyeonghuigansanim (010-4220-5069) * Applications advertising inquiries. 더 강력해진 대리운전 파파부 3.0 - 새롭게 태어난 UI로 더 간편하고 편리하게! - 더 강력해진 법인대리운전: 편리한정산과 차별화된 VIP서비스, 골프장 전용기사, 수행기사까지! - 법인대리 문의전화: 1833-8286 (우리금융그룹,롯데, 미래에셋 부터 개인사업자까지 최고의 고객사와 함께합니다.) 주요기능과 설명 = 터치 한번이면 위치, 호출,카드안심결제까지 가장 스마트한 대리운전! = 더 강력해진 추천요금, 최저가 알고리즘 (대한민국 최초 관련 특허 기술) =최초가입시 무료 마일리지 포인트 증정! = KT, LG유플러스와 단독제휴로 스팸문자 원천 차단, 카드정보 완벽 보안! =대한민국 최고의 편의 기능 제공, 대한민국 최초의 대리운전 앱서비스를 경험하세요 = 대신 불러주기, 여러 대 호출하기,정장VIP기사요청, 탁송 등 다양한 편의 기능 제공 = 법인대리 문의: 070-4354-8894 ('파파부'의요금정산기술, 주소표시와 선택모듈, 원터치 호출기능의 방식과 UI디자인은 대한민국 특허청에 의해 보호받고 있습니다. )“대리운전 파파부”는 집에서 아빠를 기다리는 귀여운 딸의 마음, '파파를 부탁해'의 정신을 실현하는 서비스를 만들어가고있습니다. 대리운전을 이용하는 아빠, 대리운전 서비스를 제공하는 아빠. 이 모두의 행복을 위해 공헌하는 서비스를 만들기위해 저희 파파부 식구들은 한시도 쉬지않고 달려왔습니다. 파파부는 2011년 대한민국 최초 앱기반 무인 대리운전 앱'원터치대리운전'을 출시하고 등록완료 특허 다수를 보유하고 있는 청년벤쳐기업입니다. 다른 서비스에서 볼 수 없는 정교한알고리즘과 세련된 UI, 적시적소에 꼭 필요한 풍부한 기능을 직관적으로 풀어낸 '대리운전파파부'는 지난 5년동안 현장에서뛰어온 저희 파파부 식구들의 자부심입니다. 많은 유혹에도 불구하고 실제번호 대신 안심번호를 사용하고 카드정보를 직접받지않고 보안성이 뛰어난 LG유플러스와 제휴하여 보관하는 등 대리운전 업체가 놓치기 쉬운 귀중한 고객정보를 소중히 다루고본질에 집중하는 기업으로 꾸준히 노력하겠습니다. 고객님 마음속 1등! 대한민국을 대표하는 서비스 1등 대리운전!앞뒤가 똑같은 1577-1577 대리운전의 어플리케이션(어플) 입니다.1577-1577 대리운전 어플리케이션(어플)은 대리운전 서비스를 이용하시는 모든 고객님들이 서비스 이용에 어려움이없으시도록 간단히 몇번만 터치하셔도 서비스를 이용하실 수 있게 제작 되었으며, 대한민국을 대표하는 대리운전인 만큼친절하고, 빠르고, 안정적인 배차 서비스를 제공해 드리고자 노력하고 있습니다! '내 차를 운전할 대리운전 기사의 보험은 가입되어 있을까? ', '사고가 났을때, 과태료가 청구됐을때 제대로 보장 받을 수있을까? ', '영수증 발급 가능할까? '등 걱정 하지 마세요! 서비스 이용 중 불편하신 점, 궁금하신 점 24시간 언제든대표번호 1577-1577과 홈페이지(http://www.1577-1577.com)을 통해 문의 주시면 빠르고 친절하게답변 해드리는 센스!고객님 마음속의 1등 대리운전 1577-1577 어플리케이션(어플) 설치하시고 친절하고, 빠르고, 안정적인 배차 서비스를누려보세요.Your mind first, andmore! Service agency representing the Republic of Korea, includingone driving!The application of the same before and after the 1577-1577surrogate operation (application).1577-1577 deputy driving applications (Apps) are all you havebeen able to simply making use of the services acceptable to toucha few times this difficulty eopeusi who use proxy services to driveservice, friendly operation as deputy representative of theRepublic of Korea and, fast, and is committed to providing reliabledispatch service! "How is joined insurance of the driver to drive my car agency? ','When the accident, could receive fines have been properlyguaranteed when the bill? ',' Is it possible issue receipts? ", Etc.Do not worry! Your use of the services that inconvenience, pleasecontact us through the 24 hours that you have always wonderedrepresentative number 1577-1577 and Main (http://www.1577-1577.com) kindly answeredquickly and give you a sense!Your mind one such operation 1577-1577 deputy application (app)installed friendly prices, fast and reliable dispatch serviceDiscover enjoyed.